We've rounded up the latest rental listings via rental site Zumper to get a sense of what to expect when it comes to hunting down a rental in Houston if you've got $1,500/month earmarked for your rent. Listed at $1,500/month, this 1,024-square-foot one-bedroom, one-bathroom condo is located at 7575 Kirby Drive, #1305. The building boasts assigned garage parking, a swimming pool, a fitness center, secured entry and a business center. The apartment includes air conditioning, hardwood flooring, a balcony, in-unit laundry, a ceiling fan, stainless steel appliances, a dishwasher, high ceilings and a walk-in closet. Pet owners, inquire elsewhere: this spot doesn't allow cats or dogs. The rental doesn't require a leasing fee. According to Walk Score, the surrounding area is quite walkable, is great for biking and offers many nearby public transportation options. Next, there's this one-bedroom, one-bathroom situated at 3100 Smith St. It's listed for $1,499/month. Building amenities include assigned parking and a swimming pool. In the furnished unit, there are a dishwasher, in-unit laundry, air conditioning, hardwood flooring, a ceiling fan, quartz countertops and a walk-in closet. If you've got a pet, you'll be happy to learn that cats and dogs are permitted. Future tenants needn't worry about a leasing fee. According to Walk Score, the surrounding area is friendly for those on foot, is relatively bikeable and has excellent transit. Listed at $1,485/month, this 673-square-foot one-bedroom, one-bathroom is located at 145 Heights Blvd. In the condo, you can expect a dishwasher, in-unit laundry, a balcony, air conditioning, hardwood flooring, stainless steel appliances, wooden cabinetry and a ceiling fan. When it comes to building amenities, anticipate assigned garage parking and a swimming pool. Good news for animal lovers: both dogs and cats are allowed here. The rental doesn't require a leasing fee. According to Walk Score's assessment, the area around this address is very walkable, is convenient for biking and has some transit options. 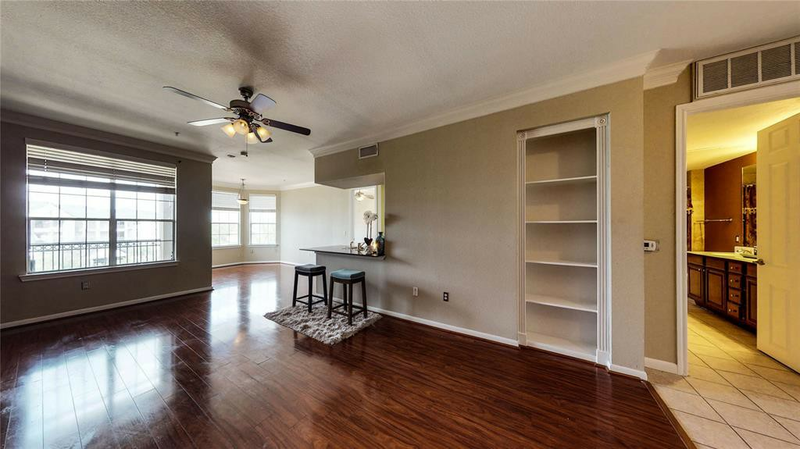 Finally, there's this one-bedroom, one-bathroom apartment situated at 2110 Westheimer Road. It's listed for $1,470/month for its 629 square feet of space. In the unit, you'll find air conditioning, hardwood flooring, wooden cabinetry, stainless steel appliances, a breakfast bar, a dishwasher, a ceiling fan and high ceilings. The building boasts a swimming pool and a lounge. When it comes to pets, both meows and barks are welcome. Walk Score indicates that this location is very walkable, is relatively bikeable and has a few nearby public transportation options.